Welcome to Centaur Property Solutions, Your Partner in Wealth Creation. Centaur Property Solutions is a dynamic real estate company that specialises in a broad range of disciplines including property management, strata management, buyers advocacy, market research, due diligence, and client property acquisition representation. We offer an independent, premium suite of professional services that are tailored to the needs of our business partners and their clients to ensure the best possible outcome is achieved from every transaction. We are industry experts with a long history in both domestic and international property markets. “David approached our organisation wanting to partner with us to provide his company’s services to our database. After numerous discussions, a face to face meeting and further due diligence, we decided to commit to the relationship and have signed the agreement with Centaur. I was so impressed with David and his organisation that I asked if it was possible to become a client. David was more than happy to accommodate me and I went through Centaur’s unique client engagement process, which was excellent. They managed to refinance my existing debt which has saved me a considerable sum of money in interest repayments, and they also matched me to an investment property which I am also very happy with. I have now consolidated my debt and am building my property portfolio under David’s tutelage. As an organisation, we are very happy to have partnered with David and the Centaur Group, and as a client of Centaur, I am personally over the moon. We are excited about the prospects of growing our business by leveraging the Centaur initiative and couldn’t be happier. We would recommend any company looking at a similar arrangement to get involved. My siblings and I were looking to invest in a property together, we had a few ideas of the property market but nothing that we all felt comfortable with. My sister Melissa, brother Arron and I met David at this time and were a little sceptical from various stories we had heard about people in the property game, however on our next meeting with Melissa and I, we both felt David had excellent knowledge of the market Australia wide, and he recommended a number of places which had extensive research done on them, which made everything a lot clearer. We both felt he had all of our best interests at heart and walked away feeling completely trusting and comfortable that an investment with David was definitely the right move. We followed David’s recommendation and bought a fantastic apartment in a small complex in Brisbane. The apartment has a great tenant in place and we couldn’t be happier. After this went through I contacted David and explained how thankful I was he made the transition so smooth and helped us obtain the apartment that I wanted to proceed straight away and get one on my own with his expertise, He couldn’t have been more helpful and found me an amazing apartment in an incredible project in Melbourne. 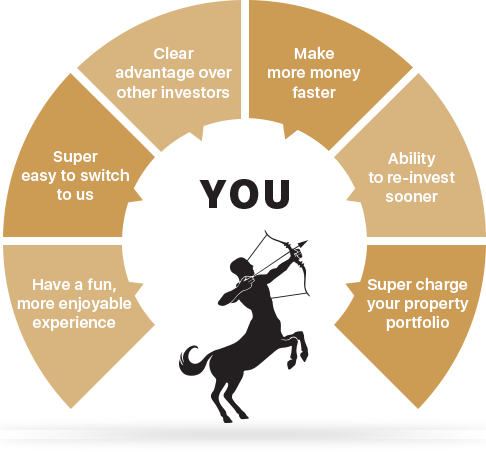 I am building a diversified property portfolio with David’s guidance and couldn’t be happier. I was looking for an investment property for my Self-Managed Super Fund. David understood this was my first time investing and worked tirelessly to keep me informed and in control throughout the process. David sourced an amazing property within the financial and legal confines of a SMSF. The property is currently performing better than projected. A bonus for me! I am looking for future investments and will be using David’s services once again. I cannot recommend him highly enough. If you are looking for someone who is willing to source good quality product with an open and honest approach to satisfying your requirements, then David is your guy. David provided an efficient service which allowed me concentrate on my own work while he did his. Meanwhile he kept me well informed and offered me many options to view. When it came to negotiations he closed the deal for me at a price that I did not think was possible. Overall, I was very pleased with the outcome because I obtained a low maintenance property and good tenant without much effort, at a good price. Dear David, I am so grateful and pleased to have you as an agent. You are easy to deal with, friendly yet highly professional. I am impressed by your professionalism you are always ahead of my enquiries and in providing me with full explanation and detailed information step by step. I appreciate your honest advice all the way through. Thank you as well for being so cooperative and open for any suggestions and for working hard to meet it. I would highly recommend you.